Thanks to the RAB Trust I was lucky enough to be awarded a combination of the book ‘1520-1724 Liutai In Brescia’ along with a workshop placement with Helen Michetschläger in Manchester. 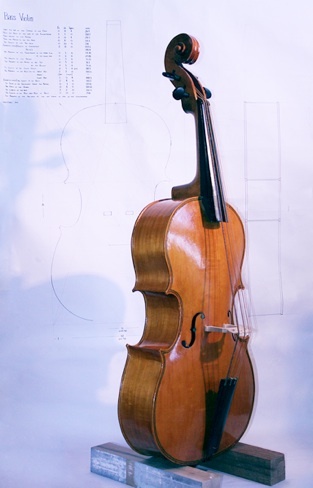 The book allowed me to get to grips with an area of making that had already piqued my interest and provided a wealth of information that also informed me on aspects of design and proportion that came in useful later in the year whilst beginning work on a project to reconstruct a 17th century Bass Violin from measurements. 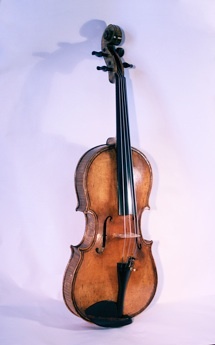 In October 2015 I made my way to Helen’s workshop for 5 days taking with me some existing work in the form of a new viola and a recently completed viola. Whilst there it’s safe to say I learned a great deal, and as someone setting out to become a self-employed maker it was incredibly useful to learn from Helen who is a well established and highly respected maker. 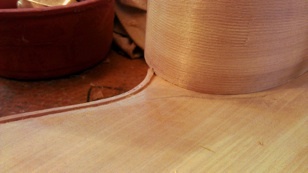 The week ended with the purfling channels being cut into the completed plates and a new bridge for the viola which was completed just in the nick of time to make the run to the train home. Amidst the work we managed to discuss several points of interest around being a self employed maker which proved at least as valuable as what was learned at the bench.